Known as a silent killer, chronic kidney disease often causes severe organ damage before symptoms — such as blood in the urine, swollen hands and feet, and excessive thirst — develop. In the advanced phases, patients develop serious complications, including high blood pressure, and eventually the kidneys may fail. Researchers have identified a common protein in the blood — measured by a simple test — that can reliably predict a person's risk of developing chronic kidney disease months and even years before the common ailment starts causing damage. The findings are published online today in the New England Journal of Medicine (NEJM). "For the last century, doctors have relied on creatinine levels and urine protein levels to detect and monitor kidney disease," says Salim S. Hayek, MD, first author of the study and Emory University cardiology research fellow at the Emory Clinical Cardiovascular Research Institute (ECCRI). "These markers are useful in diagnosing kidney disease, but are not helpful in predicting whether a person might develop disease in the future. We need to find a way to identify those at risk, in order to prevent the disease or catch it in its early stages." Researchers measured suPAR levels and kidney function (based on eGFR rates) in 2,292 people at baseline and again at follow up. Forty percent of subjects with high suPAR levels (greater than 3,040 ng/mL) but no known kidney disease (ie, normal eGFR levels) went on to develop chronic kidney disease over the course of five years. In comparison, only 10 percent of those with low suPAR levels at baseline developed the disease. Moreover, suPAR was shown to predict eGFR decline in patients with already established earlier stage kidney disease as well, regardless of their age, gender or race. Earlier observations by Jochen Reiser, MD, co-senior author of the study, Rush University Medical Center, suggested a role for suPAR in causing the kidney disease known as Focal and Segmental Glomerulosclerosis (kidney scarring). While additional research is needed, the new results indicate a far broader role for suPAR across all of chronic kidney disease and thus have major public health implications. The NEJM paper measured suPAR in two unique patient cohorts. The previously described primary findings are based on patients in the Emory Cardiovascular Biobank, a cohort of patients with cardiovascular disease (excluding patients with cancer or active inflammation). "In this cohort, subjects with very high suPAR levels (i.e., greater than 4,020) had a very high chance -80 percent - of developing kidney disease in 10 years", said Reiser. This is after researchers statistically controlled for certain factors known to increase suPAR levels, including cancer and inflammation. The results were replicated in a vastly different patient cohort -women in the Women's Interagency HIV Study (WIHS). 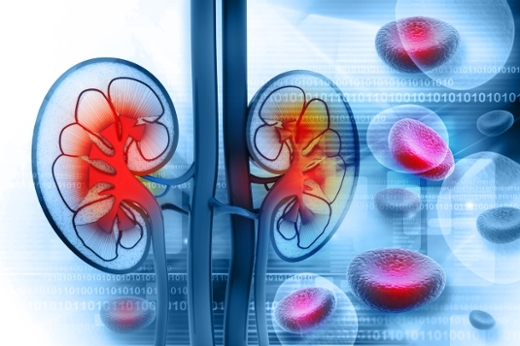 After controlling for HIV, which is known to elevate suPAR, the researchers confirmed their initial findings that high suPAR levels predict decline in kidney function, albeit at a slower rate than in the Emory cohort. Researchers say this was an expected finding since people in the Emory cohort were older and at greater risk for heart disease than the younger, heart-healthier women in the WIHS cohort. "Not every cohort has the same risk as another cohort, since various illnesses and risk factors contribute to risk differently," explains Arshed Quyyumi, MD, co-senior author of the NEJM study, professor of medicine (cardiology), Emory University School of Medicine and co-director of the ECCRI. "That's why it's going to be important to look at suPAR levels in a few more cohorts before we can accurately predict risk for different patients." Quyyumi, Hayek and their colleagues will continue their suPAR research exploring the connection between kidney and cardiovascular disease in additional cohorts. "We have previously shown in the Emory Cardiovascular Biobank that suPAR is strongly associated with heart disease and increased risk of death," says Hayek. "Patients with kidney disease also have a higher burden of cardiovascular disease. SuPAR could possibly be the link between kidney and heart disease." Four other medical institutions collaborated with Emory on the paper: Rush University Medical Center, Harvard Medical School, NYU Langone Medical Center, and John H. Stroger, Jr. Hospital of Cook County. The NEJM article appears in Online First today and will also appear in the printed issue of the journal on November 12.